Jalfrezi, like other well known curries in modern day Pakistani restaurants famous for their authenticity of royalty of Mughal empire, is the only which does not really belongs to Mughali cuisine but it was invented in British Raj time period. Almost anyone who frequently visits Pakistani restaurants these days will surely be familiar with jalfrezi curries. Most of the curries we see in Pakistani restaurants originated in Pakistan, India or Bangladesh. The latter two countries were part of a much larger India until 1947. Jalfrezi recipes originally appeared in cookbooks of the British Raj as a way of using up leftovers (a practice taboo to Hindus specially) by frying them in chilli and onion. This English language usage derived from the colloquial Bengali word jhālpharezī: in Bengali, jhāl means spicy food; in Urdu/Persian, parhezī means suitable for a diet; or in British English, frezi means stir fry. Some people strongly believe that when the British came over to subcontinent, the chefs they brought were British, they had to adopt the royal kitchens, food, spices, vegetations, measuring scales and utensils available to them, mainly to work with mughali bawarchies (Mughal chefs). Many new servants to the British elite were made up primarily of a Buddhist tribe from what is now Bangladesh called the Mogs. The Mogs were made to cook these festive roasts such as giant turkeys, beef roasts and venison working with British chefs over large fires in terribly hot and uncomfortable conditions. So, a mix and match by using Subcontinental spices with British techniques an Anglo-Indian cuisine were invented. You may credit the Governor General for the state of Bengal, Lord Marcus Sundays who enjoyed spicy Indian foods. He is also credited with converting Tamarind/Jaggery Chutney into Worcestershire sauce. Many dishes are cooked quite a lot the same way when it was first cooked back in the days of the British Raj,Jalfrezi curries are no different. A bunch of others believe that, the British that lived and worked in India at the time were homesick for good old British style cooking. They loved their roast dinners and boiled vegetables. The well to do amongst them were also known to have thrown huge parties almost always had a lot of food left over. Wasting this food was not an option. The British may have liked large roasts but they refused to throw away good food and asked their servants to cook and serve the left-overs during the week. On left-over days they were able to put a little bit of themselves into the dishes. They added lots of spice and stir fried the cold cuts of left-over meat in curry pans over much smaller fires and very quickly. 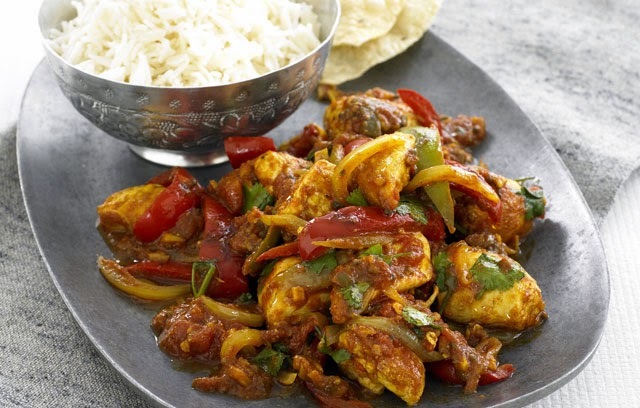 What resulted were recipes like this spicy - stir fried turkey jalfrezi which just so happens to be a great way to use up whatever is left from your Christmas turkey.This was especially so, it is believed the first jalfrezi curries were made. Even then a complex and complicated history it has, making a simple Jalfrezi involves frying marinated pieces of meat, fish or vegetables in oil and spices with lot of tomatoes to produce a dry thick sauce. All Jalfrezi dishes have other visible main ingredients include bell pepper, onion, garlic, ginger, tomatoes, and Serrano. Typically, a jalfrezi can range in heat from a medium dish to a very hot one because the dish includes green chillies, those eating jalfrezi cool it down by combining it with cream, but hotness all depends on personal likeness, its optional to add a lot green chilies. As the time passed, Pakistani and Indian restaurants adapted the method to make stir-fry with marinated meats. . Nowadays, the meats not be leftovers, precooked, or even marinated. The Lamb is marinated for one hour, Prawns and Chicken are marinated for 15 minutes. Paneer are not marinated at all. Vegetables are blanched. The spices are almost same. You can master your own version. You may not use any meats at all, and use different vegetables instead. Take the chicken pieces and coat it in the cumin, ground coriander and turmeric then leave it to marinade for 15 minutes while you make the homemade tomato puree. For tomato puree - blanch the plum tomatoes, peel them, put the peeled soft plum tomatoes in a food processor and give it a good whizz - aim for a smooth consistency. To make the chicken and sauce, heat oil in wok, fry the marinated chicken, add salt, red chili powder, turmeric powder, roughly chopped onions with the garlic and ginger paste. Fry the marinaded chicken till chicken is golden and onions become soft and translucent. Add tomato puree to the frying chicken and stir continuously. Add the water to the chicken and tomato puree mixture and simmer this for around 20 minutes. While that is simmering, take a frying pan, heat two tbsp of oil, stir fry carrots, in with bell peppers, do not fry onion and tomatoes with these vegetables because onions are already soft, those would be broken if precooked before adding to chicken sauce. Turn down the heat and add the earlier prepared stir fried vegetables to the cooked chicken and simmer for around 10 minutes. Add onions, tomatoes and chilies at this point stir this until the onions are coated with sauce and soften (and the chicken is cooked, of course). Just before you dish it up, stir in the garam masala and chopped coriander leaves. Serve with basmati rice or naan bread.